Another look at an eruption of the Mt. 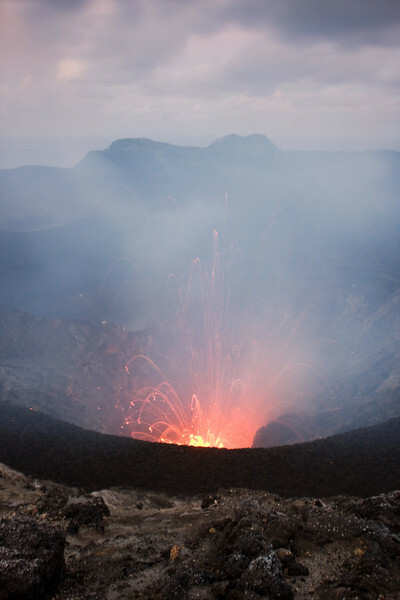 Yasur volcano, this time showing one of the four crater floor vents from which molten material is ejected. 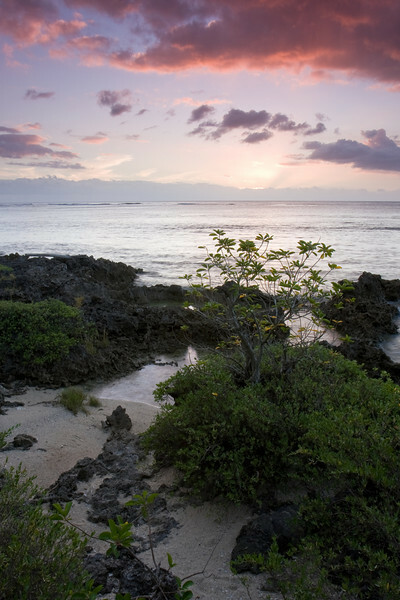 Sunset along the island's western coast. 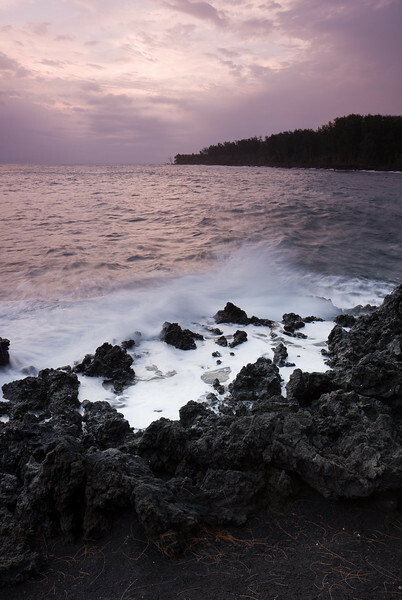 A long exposure smoothed out the gentle waves brushing up against the sharp volcanic shoreline. 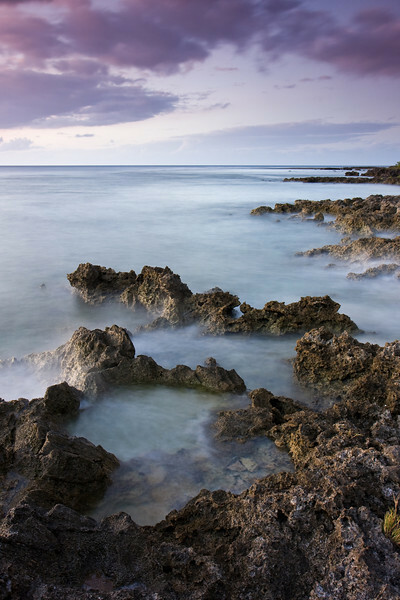 An evening shot along the west coast of the island. 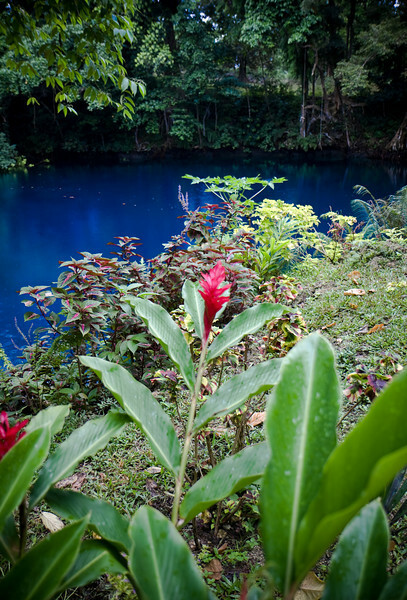 One of the many 'blue holes' found on the island. 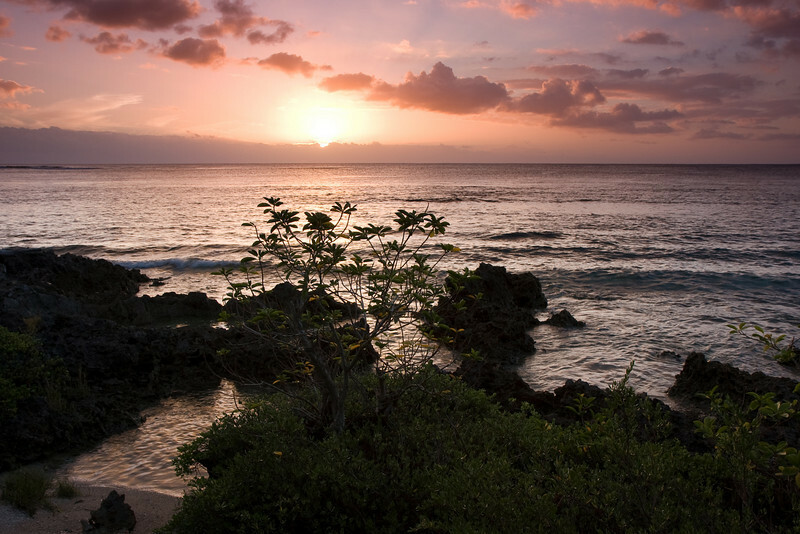 This is a 5 shot panorama stitched together in CS3. 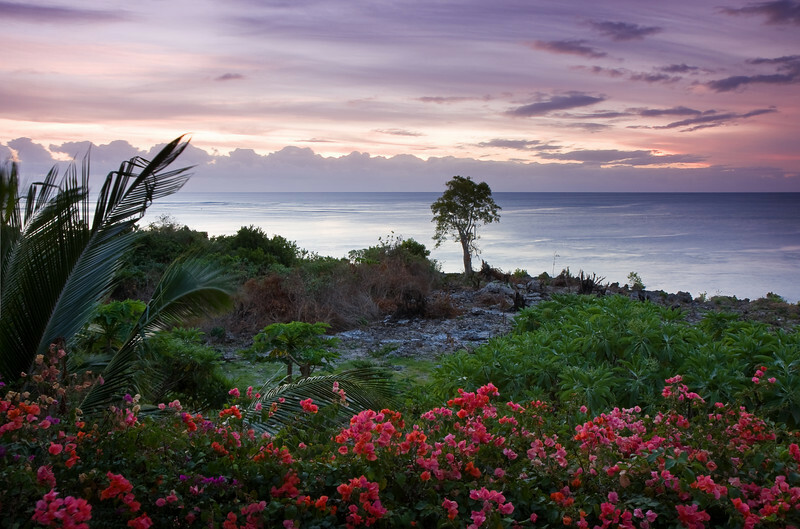 The view from the main dining room at the Tanna Evergreen Bungalows, at dusk. 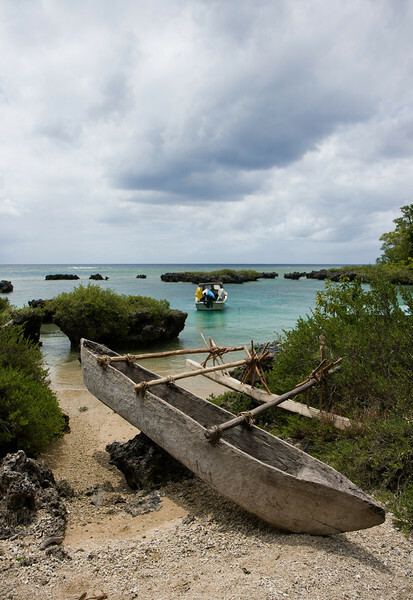 Boats, old-style and new- pulled up on a thin strip of beach along the island's rocky west coast. With a loud concussive bang, Mt. 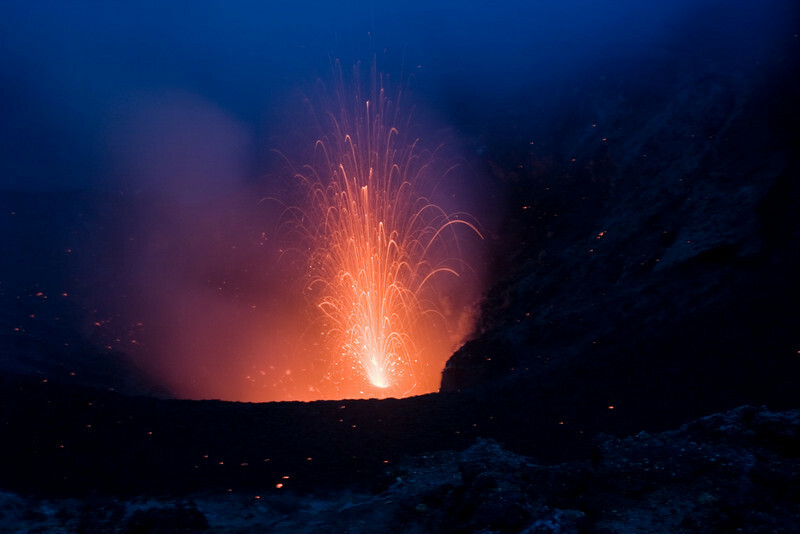 Yasur blows lava around inside its crater. My camera was tripod-mounted for this shot - I believe the visible blur in the photo was from the ground the tripod was sitting on shaking, not from me shaking the tripod! 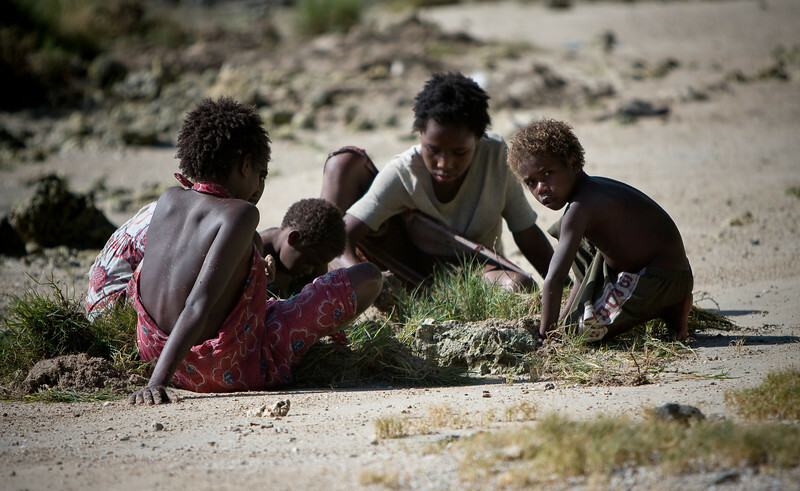 Family on the beach, digging up the plants. I never could figure out why they were doing this. 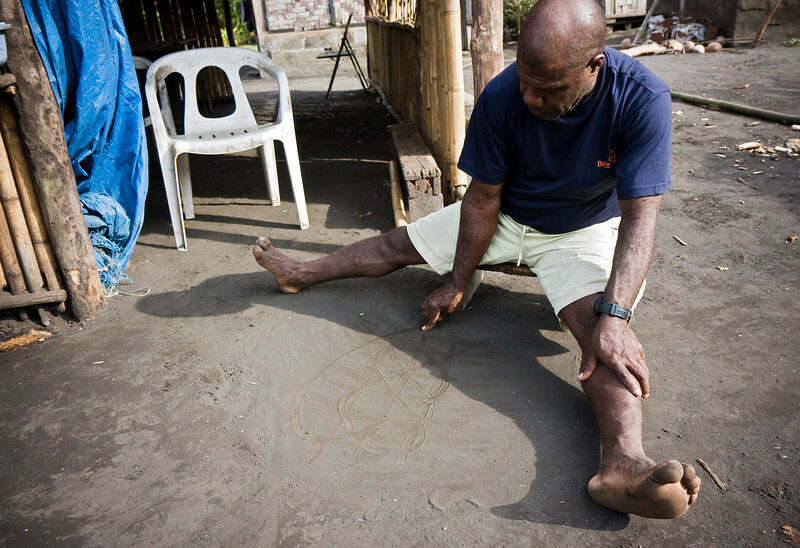 Philip, chief of Emiotungun village, demonstrates for me the Ambrym island art of sand drawing. Joses, my guide pausing at the foot of Mt. 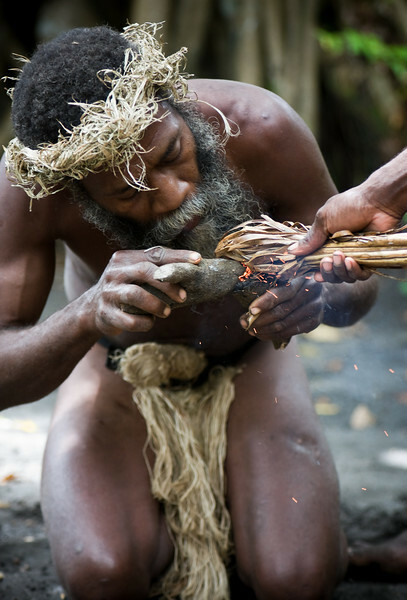 Marum. 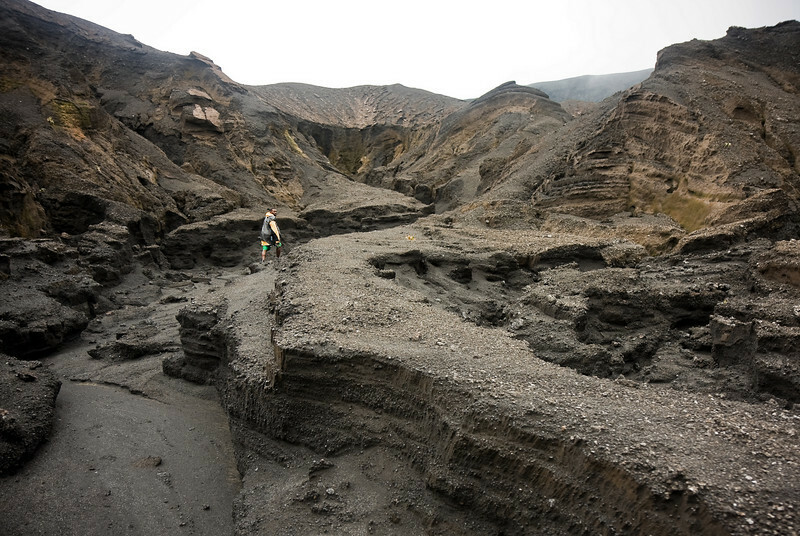 My hiking guide leading me through the rugged canyons and channels of the ash plain between the two volcanos. 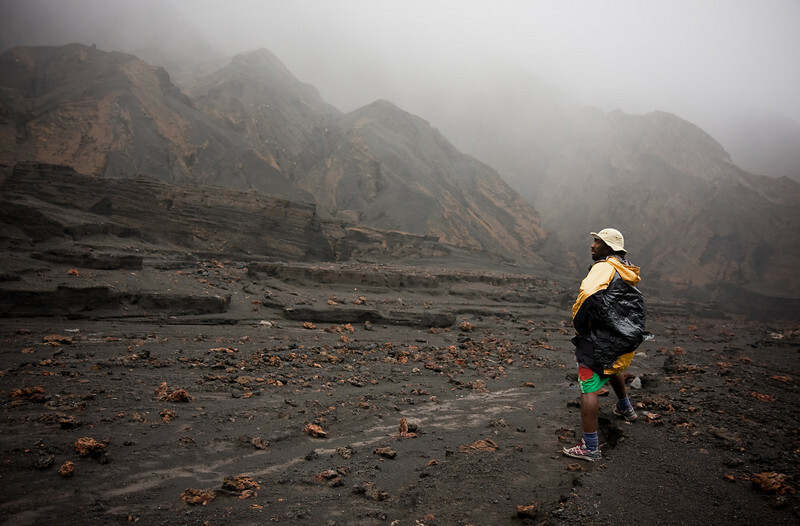 Joses, my hiking guide on the edge of the Marum crater on the top of Mt. 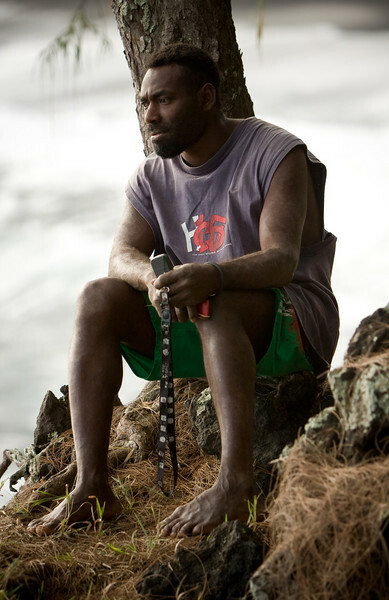 Marum. 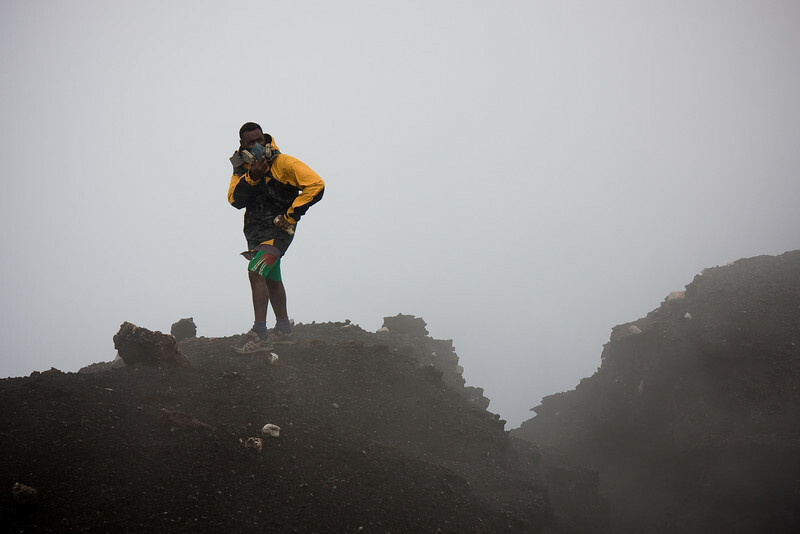 There was enough of the irritating volcanic gas in the air to warrant using the gas masks we brought along. Mt. Marum has a pool of molten lava down in it's crater floor, 600 meters behind and below where Joses was standing in this photo. We could hear it bubbling and churning through the fog, but the pea-soup thick fog and clouds weren't in the mood to allow us a glimpse this day. 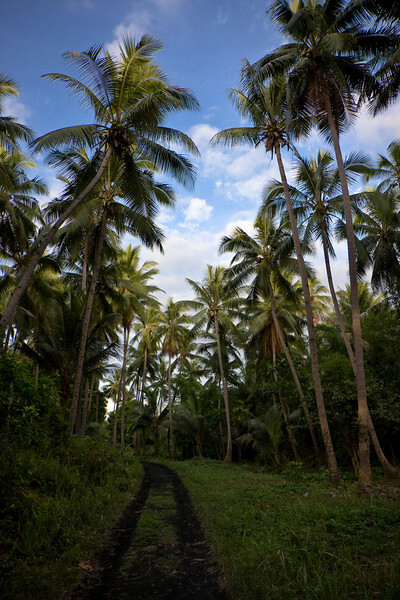 One of the two main roads on the island. Not exactly multi-lane freeways, here. 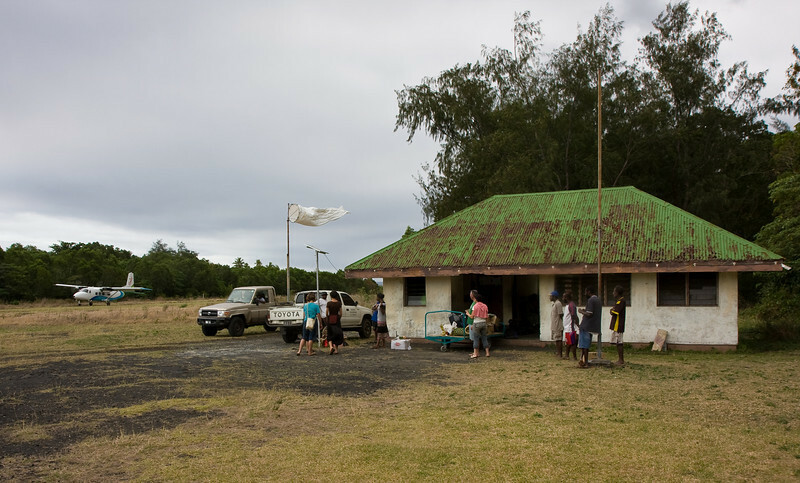 My first two weeks in Vanuatu were cloudy, gray and wet. This was the sole instance of any sort of color at sunset I had during that entire time period. I tried to make the most of it. 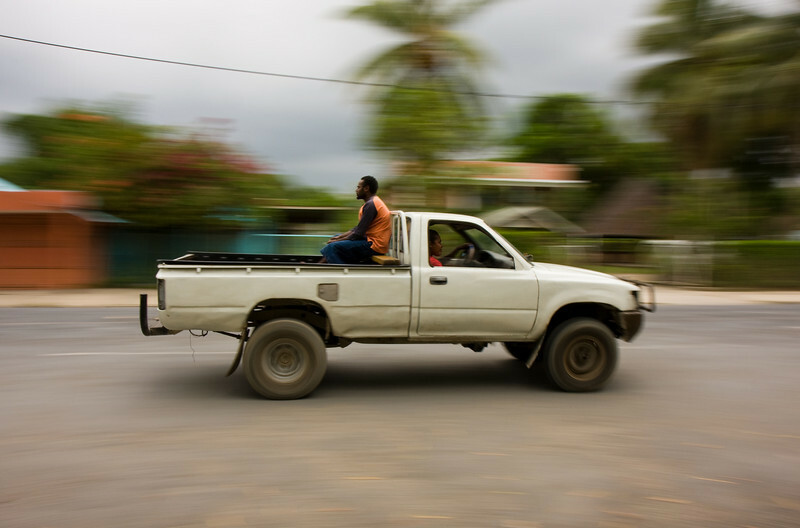 Transport trucks such as this make up the primary method of road transport around those islands that have roads - piling in the back with others can be a social affair. Here, a lone rider keeps himself company. 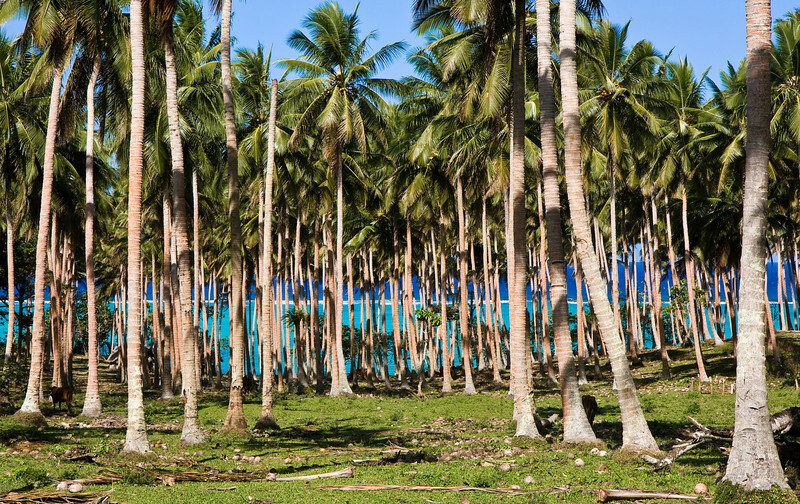 Three distinct shades of blue as seen through a coconut palm grove. The bottom two are the colors of the deep water outside and the shallow water inside the reef break, respectively. 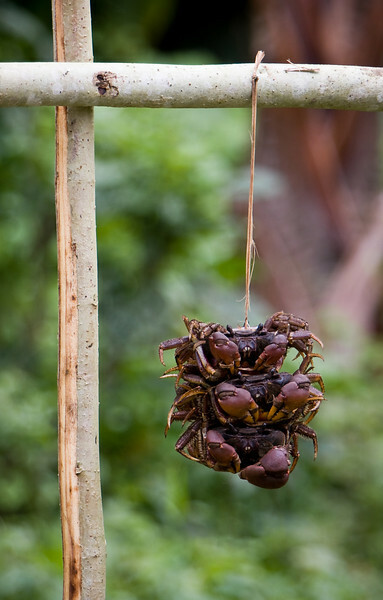 Live landcrabs bundled for sale along the roadside. 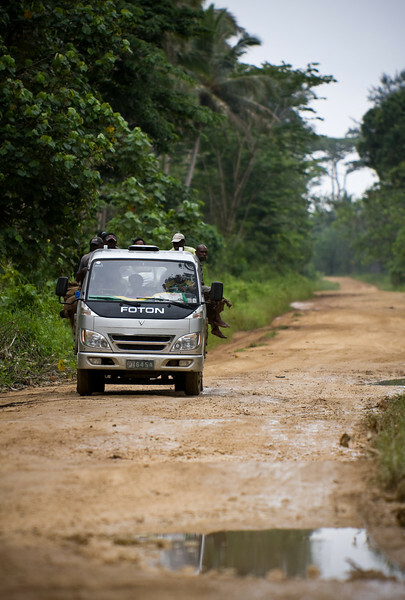 A transport truck hauls men and copra along the main highway. 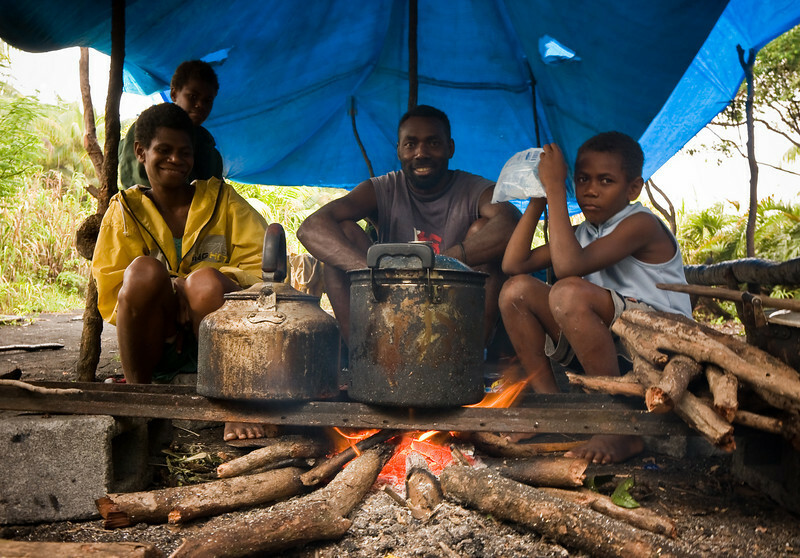 Joses and his family at the permanent camp up on the ash plain in the middle of the island. 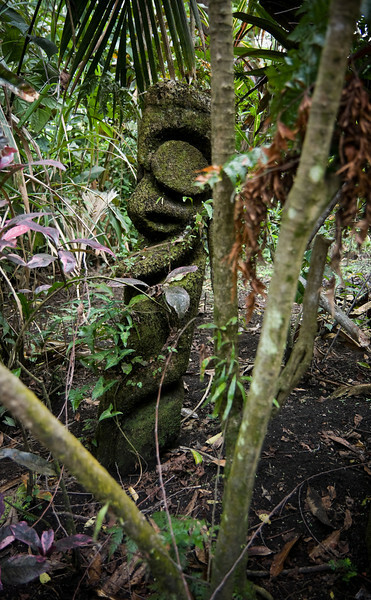 An old, traditional black palm sculpture stands in the jungle. 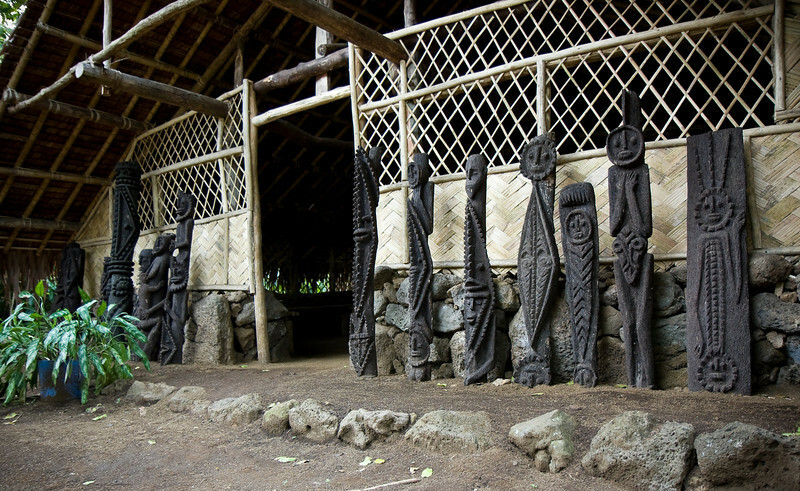 New-ish semi-traditional black palm sculptures stand outside a kastom nakumal (i.e. traditional meeting place). 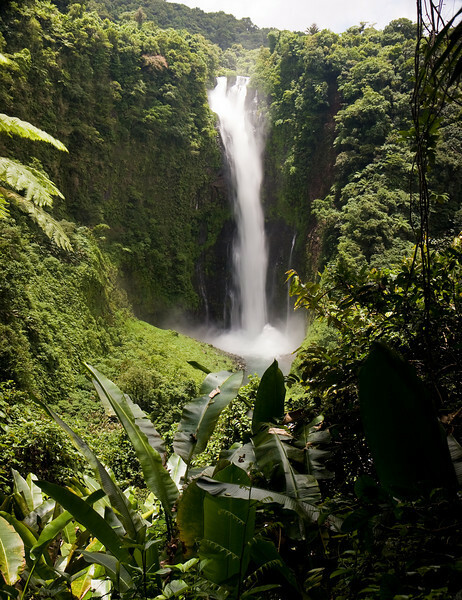 At 120 meters, Siri falls is the tallest cascade in the country. 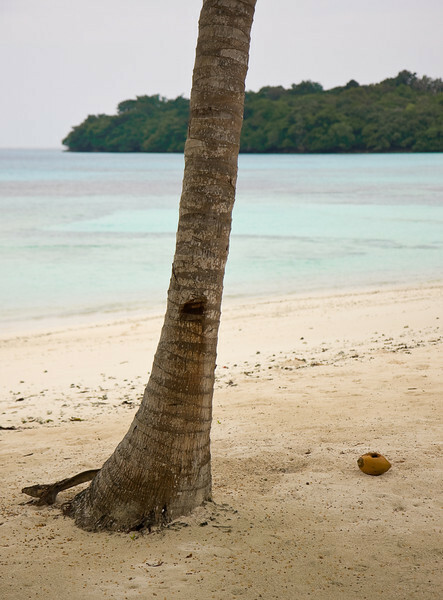 Champagne beach on an overcast day. 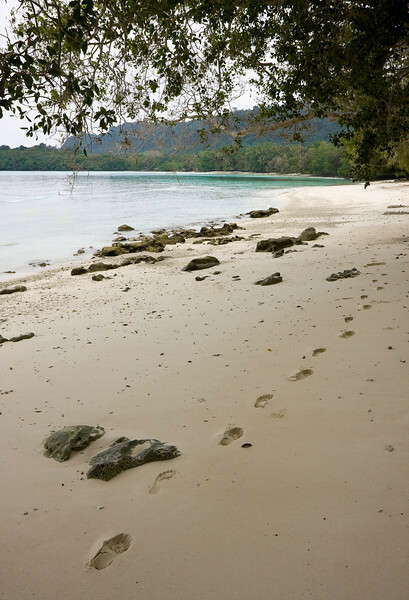 Lone footprints on Lonnoc beach. 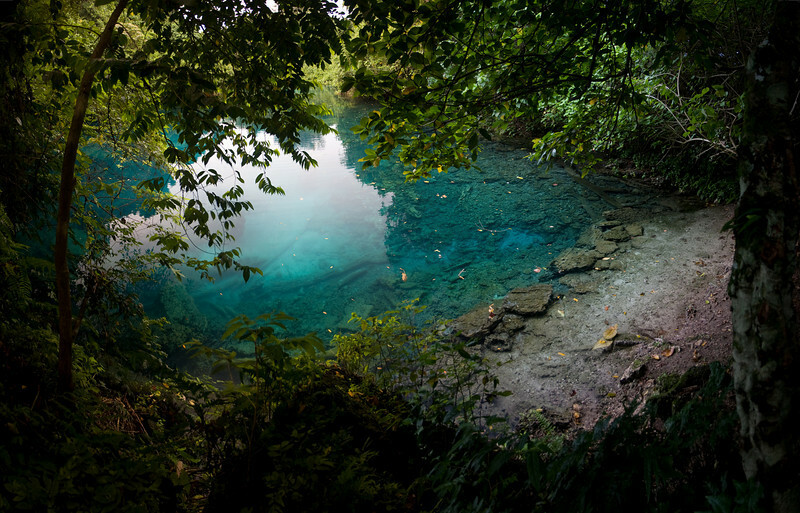 The heavy overcast day dulled the sparkle of the main and most-visited 'blue hole' on the island. Still, you can see why they're called that. 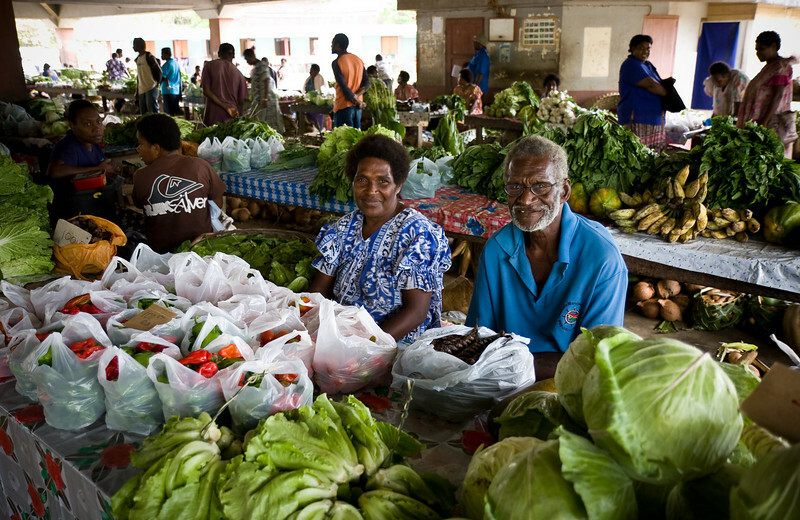 At the vegetable market in Luganville. 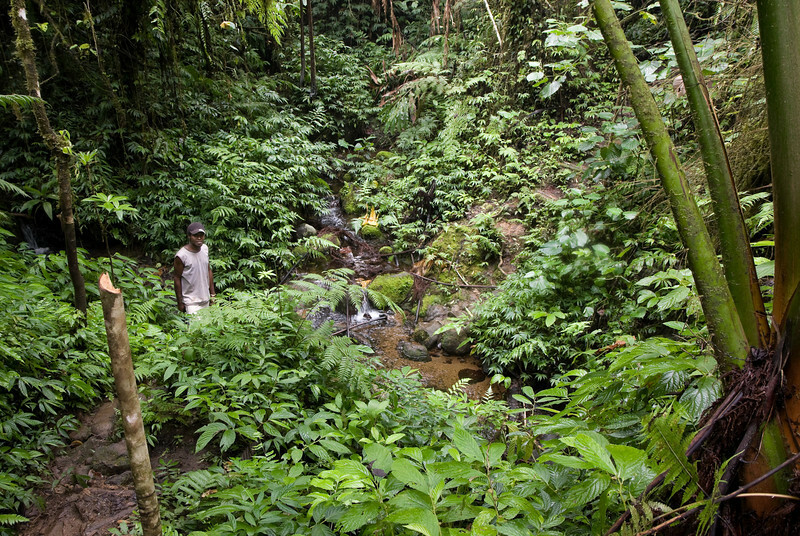 Hiking through the jungle en route to the Millennium cave. 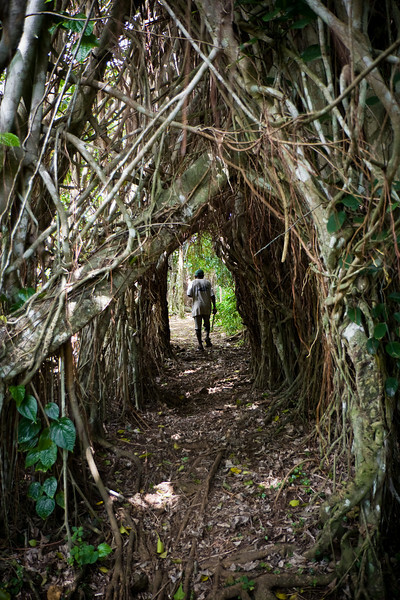 A hiking path cut through the root mass of a Banyan tree. 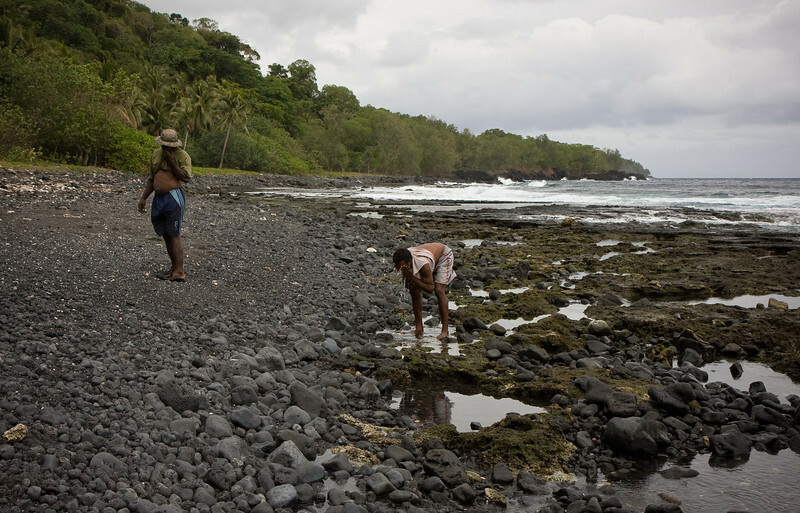 Two men splash their faces in the hot freshwater spring flowing out of the rocky beach into the ocean. Sadly, I didn't get much time here to enjoy this unusual geological feature. 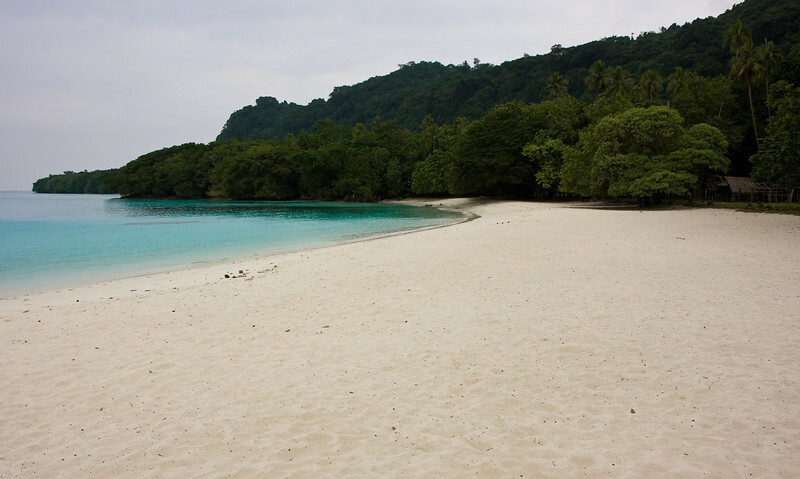 Though this was the only one of these I saw during my trip, it's my understanding several hot springs on beaches can be found throughout the Vanuatu archipelago. 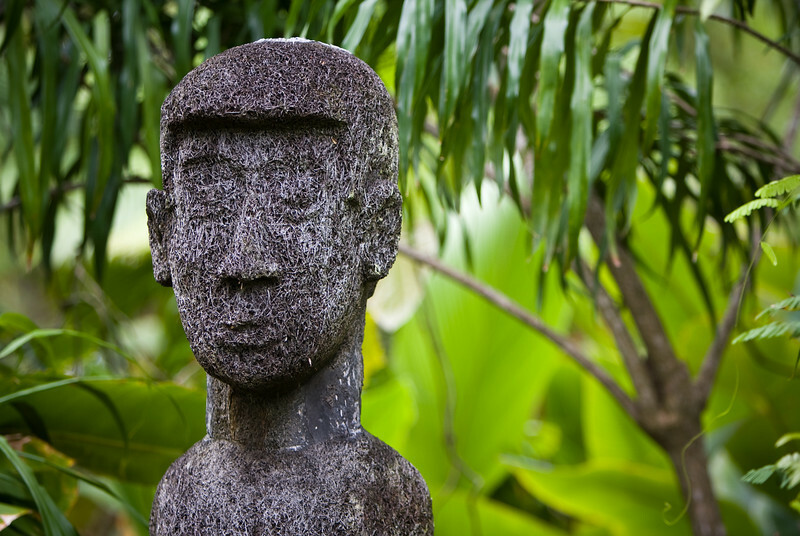 A non-traditional black palm sculpture in a hotel's grounds. A Tam-tam (i.e. 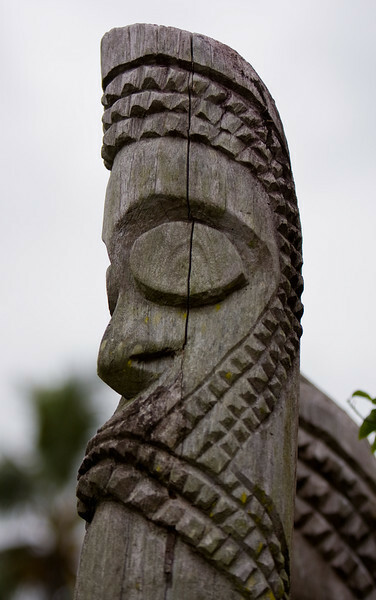 Vanuatu totem pole) in a hotel's grounds. 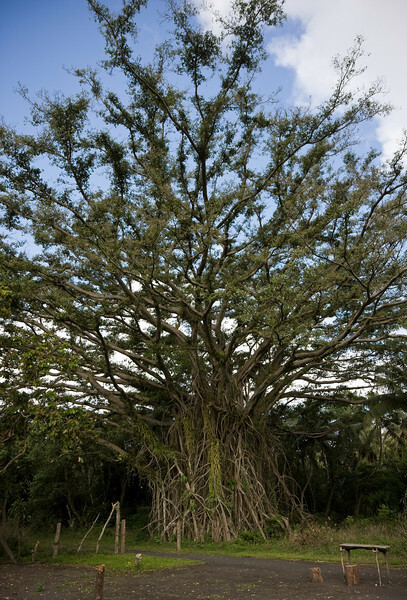 The island is well-endowed with banyans - more so than any of the other islands I visited. This one is at the Mt. Yasur volcano entrance gate. 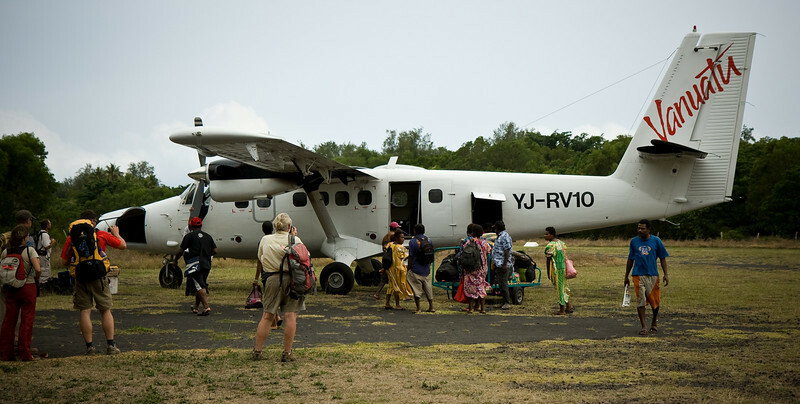 A crowd of tourists and locals alike wait to board Air Vanuatu's Twin Otter at Craig Cove. Air Vanuatu's Chinese-made Harbin Y-12 comes in for a landing at Craig Cove airport. 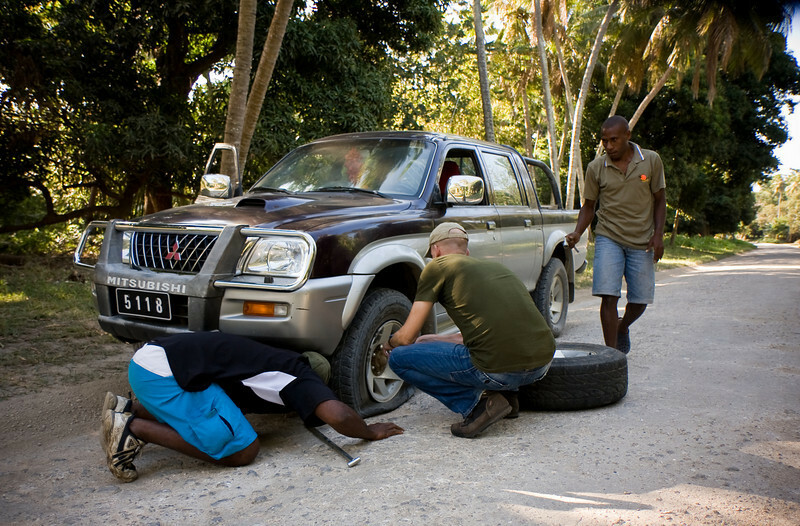 Peter, from Germany helped out the two drivers when our tire went flat. 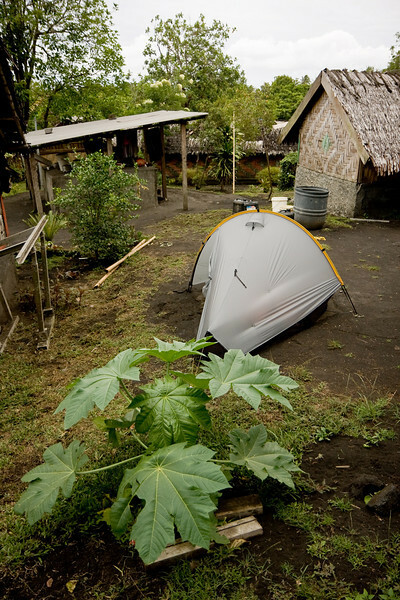 My tent setup amongst the huts of Emiotungun village. 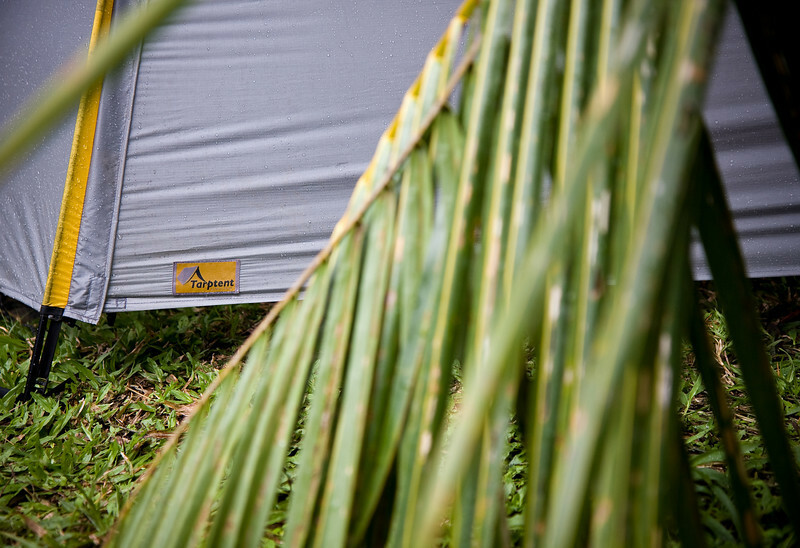 My tent parked under a palm tree. Though they may not appropriate for everyone, a person looking for a high-quality super lightweight backpacking tent should check out Tarptent. My fully-featured yet sub 2 pound tent performed excellently over what was a pretty damp trip.